Rubber bands work great for attaching your fishing line to the downrigger. In addition to being easily adjusted for different breaking strengths, they produce consistent hook-ups and are also inexpensive. 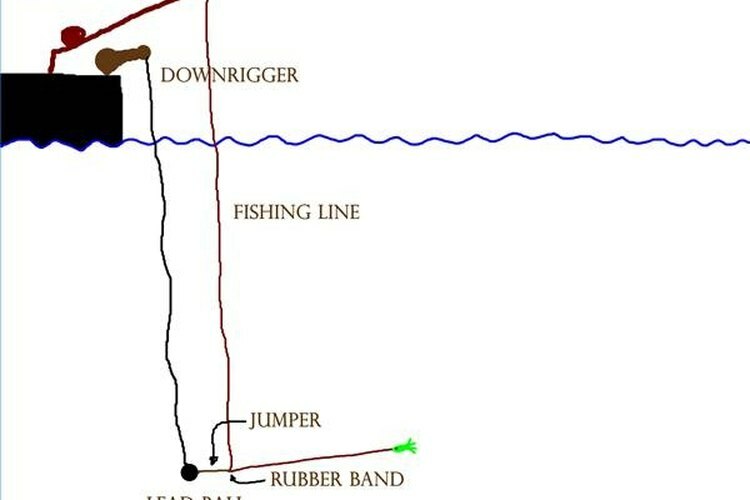 Rubber bands and downriggers have been used together since downriggers were invented. Though there are many styles of mechanical releases, it is hard to beat a rubber band's simplicity and dependability. Follow the steps below to tie two different types of rubber band knots. Before tying the rubber band to the fishing line, make up some small jumpers to run from the lead ball to the rubber band. Use about 2 feet of heavy monofilament or braided line and tie on or crimp a snap swivel on each end. Using the snap swivels will make the rigging easier and faster. See Step 1 illustration. Grasp one end of the rubber band between the left thumb and forefinger. Grasp the other end of the rubber band with the right thumb and forefinger. Begin wrapping the rubber band around the main fishing line at the spot where you want to attach the line to the lead ball. Pinch the rubber band with one hand to hold the loops in place as you wrap. See illustration Step 2. Make 5 wraps with the rubber band around the main fishing line. Stop at this point if want a stronger breaking point for the release. Using one of the jumpers made in Step 1, snap one end to the lead weight and then attach both both loops of the rubber band to the other snap. See illustration Step 2. Run one of the rubber band ends through the loop formed by the other end of the rubber band. Cinch down tight so that only one end is left. See illustration Step 4. This knot will have a lighter breaking point than using both rubber band ends as described above. Use size 16 rubber bands when fishing for smaller fish with lighter line. Try size 32 rubber bands when trolling in deep water or using heavy line for big fish. Experiment with the two styles of knots to get the breaking strength desired. Store rubber bands out of direct sun to prevent deterioration. Use caution when working with hooks.